Wind cold damp bi syndrome with deficiency of qi and blood affecting lower back and legs. Aversion to cold, fatigue, slow gait, stiff knees, weak lower back, numbness into the limbs and painful joints and tendons. 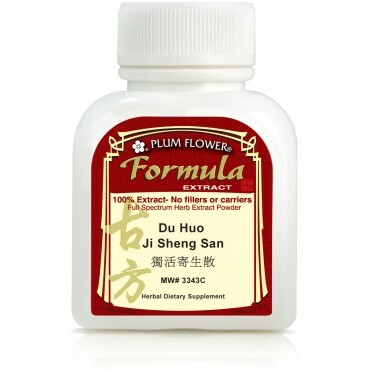 Chronic lumbago, sciatica, numbness in the limbs, arthritis and rheumatism are some of the imbalances satisfied clients have used this product for. Taxillus chinensis stem & leaf, Rehmannia glutinosa root-prepared, Codonopsis pilosula root, Angelica sinensis root, Poria cocos fungus, Angelica pubescens root, Achyranthes bidentata root, Eucommia ulmoides bark, Paeonia lactiflora root, Saposhnikovia divaricata root, Gentiana macrophylla root, Cinnamomum cassia bark, Ligusticum chuanxiong rhizome, Glycyrrhiza uralensis root. - Sang ji sheng, Shu di huang, Dang shen, Dang gui, Fu ling, Du huo, Huai niu xi, Du zhong, Bai shao, Fang feng, Qin jiao, Rou gui, Chuan xiong, Gan cao.